What it is that posseses me to knit wool hats in 80 degree weather, I couldn't say. Hat #3 is in progress as we speak. My second rather successful attempt at a hat. 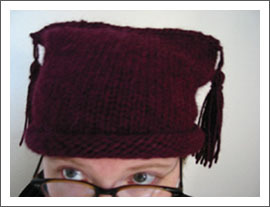 First hat on circular needles! Pattern was free with the purchase of yarn at Creative Hands in San Carlos, and was actually quite easy. I had second thoughts about adding the tassles, but am now glad that I did. It's unfortunate I don't ski, this would be a lovely hat for skiing.